We still have more than we need to so have resorted to purees, and preserving them in Sherry and more recently vodka. There is little time in the day to do anything else but pick strawberries, about 6 kilos a day. So if you have any suggestions what to do with them next..let us know. Sorry for the delay in posting a new post. For those of you that were left in unbearable suspense due to the disappearance of Beryl, we have good news. She was found late evening the day after we lost her. However the finding of her was not so straight forward. Around 4 in the afternoon the farmer came up to do some gathering of the sheep. He told us that he had spotted a strange white bird by Tal-y-Bont in the land between the two roads. (At the end of the road by Dol-y-Moch). Mum and I rushed down with a fishing net. We drove to Tal-y-Bont but saw nothing. Then we went on the main road back to the start of the road by the Oakeley Arms and did a lap of the road again. No luck. We stopped at Tal-Y-Bont to talk to Dennis a neighbour to ask if he had seen the bird. He had. Brilliant I thought. It was a chicken he said. Not so brilliant I thought. We travelled back home up the road seriously querying the sanity of the farmer. How could a farmer mistake a chicken for a duck. Yes a farmer. It was a bit of a wild goose chase you could say. No let me re-phrase that- a wild duck chase. Later that night in the lounge we were relaxing to an Inspector Frost mystery when the phone rang. It was the local farmer (Dewi) again he had spotted a white bird in his fields. Although we were dubious about his identification skills due to our last expedition we were on action stations immediately. I rushed to the shed and retrieved 2 long sticks and a fishing net. While Mum and Dad got some other cunning devices to try and trap this tricky customer. We loaded up the jeep and raced down the hill. We drove over the bridge and onto the maze of fields. We drove across to the other side where the farmer was and parked up next to him. He led us to the birds location and amazingly it was not a chicken, not a seagull, or a deformed lamb it was Beryl. I got out my fishing net and we attempted to corner Beryl. Luckily for us she's a little chunky and therefore can't take off on flat ground. But that did not mean she was easy to catch, far from it. It took us about half an hour. The farmer even got his dog out to help. Eventually dad managed to throw the net over her and jump on the net so she couldn't get out. We kept her in the net all the way home as we did not want her flying about in the jeep. When we put her back in her house with the near suicidal Boris, he was over the moon. I have never seen such a happy animal his excitement was indescribable. He was practically dancing while wagging his tail just like a dog looking at a huge plate of sausages. However she didn't seem so happy to see him she went and hid in a corner. I am very sorry to inform you that one of the Muscovy Ducks has disappeared. Her name was Beryl she was the long suffering wife of Boris. She was last seen flying west down the drive at mid-day. Mum sent me out on a search to try and find her. I spent over an hour trudging through soaking bracken, but no luck she was nowhere to be found. I checked the road the waterfall path, the bluebell meadow, the garden and the immediate area around the house. We had hoped that she would return just before dusk but to ours and Boris's disappointment she didn't. Our thoughts and feelings are with Boris who seemed incredibly sad and depressed today, he hasn't touched his food and seemed a lot less lively. At least tonight nobody will complain about his snoring. Yesterday we received 2 new recruits to our mini farm. 2 Muscovy ducks that used to belong to Huw’s Welsh teacher. After many arguments and we named them Boris and Beryl. Before the re-naming they were called George and Chloe but we thought these names didn’t quite suit their fierce appearance. Today was their first day outside in Campbell’s Cottage, and they loved it. Before today they didn’t know what a pond was. However they spent half the day bathing in the cool waters of the lower pond. Poor Beryl however was not a very confident swimmer. She was flapping her legs quick enough but she didn’t seem to be travelling any where fast as if treading water. Boris on the other hand would perch on a rock and duck his head in and out of the pond as if washing his face. Boris enjoyed himself so much that he didn’t want to go bed. Just like a toddler he threw a huge strop just before bed. It took 3 of us 30 minutes to get him to bed. And I’m not exaggerating, we tried everything, we tried to catch him with an ambush, we tried to herd him in close formation, in loose formation, high speed, low speed nothing worked. Eventually we managed to herd him close to his bed then sort of funnelled him in with a long piece of cardboard. Those of you that have visited the cottage recently will most probably be aware that we have another type animal on site. You may have spotted them outside of the cottage garden bathing in their brand new pond. We have now got 4 Indian Runner ducks. We got the first pair about a month ago they are named 'The Captain' and 'Agatha'. The captain is quite an eager 'fella' if you know what I meen. He is often seen on top of Agatha while pushing her head down underwater. Quite the gentleman you could say. However when purchasing the first pair of ducks we also ordered a pair of Khaki Campbell ducks. But I'm afraid to announce they have gone to a better place.........don't worry they're not dead they just flew off at the first opportunity they got and never returned. 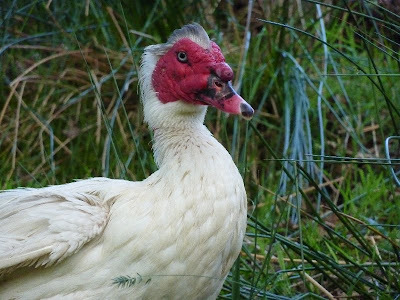 However we have heard reports from the local farmer that there are some strange looking ducks lurking round the river. So while driving past please keep your eyes peeled out of the window. About a week ago we invested in another pair of Indian runners who are recently hatched (9weeks old). They are named 'Homer' and 'Marge'. They were born in a small-holding farm near Bala. Both are still very young at the moment and have not developed their waterproof coats therefore they are kept separated from the other pair. As there is a danger that while swimming in the pond their feathers may become waterlogged and they could drown. So for now Homer and Marge are kept in the vegetable garden and have a much smaller pond made out of an old plastic drawer. In the next few days we are expecting another 2 additions one of whom looks quite ferocious but is a softy at heart.